As he reminds us with almost comic regularity, Hanta has been operating an antiquated wastepaper compactor on the outskirts of Prague for thirty-five years. He has some acquaintances in the town, but for most of his time he shares his solitude with his compactor, and with the mice that swarm the cellar in which he works. He works at a Sisyphean labor, taking time out only to go fill his pail with beer, because he truly loves his beer. He passes his days in greasy clothes and a state of inebriated equilibrium. Amongst the newsprint and bloody butcher paper that Hanta compacts are books - beautiful old, leather bound volumes that have no use in a totalitarian society. Hrabal's book is a memoir from Hanta's point of view. He seems a simpleton, but one with an eye for books, and the ability to recall quotations from Hegel, Erasmus, and Schopenhauer. And he does more: he blesses each bale of compacted paper with a carefully chosen book or art print, often open to a particularly significant passage. When he can, he rescues books from the brink of oblivion. Some he gives to furtive acquaintances, a churchman interested in the history of aviation, a professor with a passion for old theatre reviews. He takes books home and fills every available space with them; he sleeps under a precarious platform upon which he has stacked two tons of books, and which could crush him instantly should he make an unfortunate shift in his sleep. He clearly has a mania. It is only late in the book that we will find out if there is a purpose to his madness. As he performs his assigned role, his holy calling, Hanta recalls his life. He relates the tragicomical story of a love found and lost in two scatalogical episodes, with a denouement that is told with perfection. He remembers the strange gypsy girl who followed him home and waited at his door every night, who fed his meager fire and warmed his bed, whose name he does not recall and who disappeared when the Nazis occupied Prague. (He takes particular pleasure in compacting Nazi propaganda.) In the present, he sees the future in the form of a huge, state of the art, compactor manned by efficient young men in immaculate uniforms who eat their lunch with bottles of milk and who cast nary a glance at the volumes of humanity’s intellectual heritage riding the conveyor belt into oblivion. His goal is to retire and move his faithful compactor to a spot on his uncle’s property, where he can give artistic expression to the memory of the sorry task he has spent his life performing. He has visions of young Jesus and old Lao-Tzu, and armies of rats fighting it out in the sewers. When his boss peers down at him and calls him an imbecile, and hires two uniformed young milk-drinkers to work the compactor, he beings to see the writing on the wall. Tense dualities abound in this book, particularly the progressus ad futurum and the regressus ad originem, but dualities yearn for integration, a state of completeness. Hrabal’s book is itself simple in execution, yet enormous in its implications, both sad and hopeful. In its brevity, it approaches a state of perfection. When I started this blog a few years ago, it was for the vague purpose of making note of books that were by and large obscure and forgotten, yet deserving of wider acquaintance. Little did I know that Noel Perrin (among, I am sure, others) had had a similar idea many years before. He had published dozens of short reviews of such books in the Washington Post, and it is these that are collected in A Reader’s Delight. I consider myself fairly well read, but Perrin has noted many worthwhile books that I have never heard of, but which I will no doubt be tracking down in the months and years ahead. His list, I am glad to note, also overlaps my own somewhat, and we find in it such treasures as Lord Dunsany’s The Blessings of Pan, Barbellion’s The Journal of a Disappointed Man, and Charles Williams supernatural thriller All Hallow’s Eve. He also includes works by James Branch Cabell, Stendhal, and Herbert Read. Many of Perrin’s titles I recognize from having passed over them on the shelves of used bookstores. Thanks to his enthusiastic endorsements and the knowledge that his judgments ring true, I now know to stop and give them a second look. I’m happy to recommend A Reader’s Delight to all my fellow bibliophiles. Tales of the Inquisition, or, You Can't Torquemada Anything! This work, published in English translation in 1907, was apparently an attempt to rebut the perceived anti-Catholicism of the 19th century chronicler of the Inquisition, Henry Charles Lea. In a short work, the author traces the Church attitudes towards heresy from the earliest Church Fathers through the 14th century. One has to give some grudging admiration to the author’s perseverance in asserting, in the face of the most heinous evidence, that although the Inquisition was bad, it wasn’t quite as bad as some would make it out to be. His is a decidedly uphill battle. With memory fresh from its own brutal suppression under the Roman Empire prior to Constantine, the early doctors of the Church adopted a rather gentle approach to heresy. In his Divinae Institutiones (308 AD), Lactantius wrote: “If you wish to defend religion by bloodshed, by tortures and by crime, you no longer defend it, but pollute and profane it. For nothing is so much a matter of free will as religion.” While Tertullian wrote harshly of the Gnostic heresies, he likewise declared that “(i)t is a fundamental human right, a privilege of nature, that every man should worship according to his convictions. It is assuredly no part of religion to compel religion.” The preferred method of dealing with heretics and apostates was that which could be traced back to St. Paul: simple excommunication. Augustine, a former Manichean who also dealt with the Donatist schism in North Africa, began with a policy of absolute tolerance which ultimately evolved into a reasoning that errant sheep must be goaded back into the fold, sometimes with firm measures (flogging is acceptable, as was exile), but that the death penalty was contrary to the ideal of Christian charity. His is an interesting evolution, inasmuch as he had to contend with secular authorities for whom the death penalty was justified in cases of groups fomenting civil unrest, a perspective which Augustine ultimately noted had some justification. The next portion of the book deals with the establishment of what we have come to know as the classic model of coercion in the Church, the monastic (i.e. Dominican and Franciscan) Inquisition. Vacandard notes that the true beginning of the Inquisition dates to the Sicilian Code of Frederic II, prepared in response to Gregory IX’s request that heretics be prosecuted with utmost severity. It became codified that all suspected heretics were to be tried by an ecclesiastical tribunal, with the guilty and unrepentant being condemned to the stake. The persecution was an active one, with bishops and archbishops being directed to visit once a year or more any parish where heresy was thought to exist. One or two “trustworthy” men were then compelled to denounce any citizen whose mode of thought or living deviated from that of the “ordinary Catholic”. It was the reluctance or ineptness of the bishops to engage in such practices, with such latitude for abuse that compelled the Pope to put the real power of the Inquisition in the hands of the mendicant orders of Dominicans and Franciscans. The procedures established under the Inquisition were, to our sensibilities, atrocious. Suspected heretics were not informed of who might have given their names to the authorities, they were not allowed counsel, and witnesses in their defense were rarely given the opportunity to appear (and most likely wouldn’t have, given the risk of associative guilt). All these were considered by the Inquisitors to be adequate “safeguards” against abuse, although we find them tragically laughable today. The accused had a simple choice: abjure his heresy and repent, or deny heresy and suffer the consequences. Penance might range from (among other minor humiliations) having to wear the yellow cross for a period of time to confiscation of property and imprisonment. Quoting Lea, Vacandard notes that the “Inquisitor never condemned to death, but merely withdrew the protection of the Church from the hardened and impenitent sinner who afforded no hope of conversion, or from him who showed by relapse that there was no trust to be placed in his pretended repentance.” In other words, there was no appeal to individual conscience in the face of the authority of the Church. 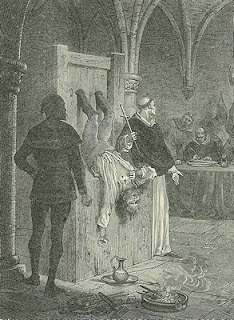 Next, the establishment of the use of torture in 1252 under the papacy of Innocent IV is discussed. Vacandard makes some objection that the heinous activities of the Inquisitors did not necessarily echo the directives of the Popes, who “exercised a supervision which was always just and at times most kindly.” I need not go into the details of the cruel procedures inflicted by secular authorities under the “direction” of the Inquisitors, but suffice it to say that they do not bear out Vacandard’s summation that “we must at least give [the Church] credit of insisting that torture ‘should never imperil life and limb’”. It is interesting to note that he admits that, although they did utilize hideously cruel means of extracting confessions, the Inquisitors did in fact realize “so well that forced confessions were valueless, and that they required the prisoner to confirm them after he had left the torture chamber.” It was the fact that it was the confession taken outside the torture chamber that counted as “official” that allowed the preceding torture to be downplayed, a tactic that plays right into Vacandard’s hands as an apologist for the Church. The remainder of the book is largely a summation of what was discussed before, with emphasis on the thinking of theologians and canonists on the purpose and methods of the Inquisition, which saw heresy first and foremost as an offense against God. By the end, Vacandard’s attempts to mitigate the worst excesses of the Inquisition as being subsequently exaggerated, or being prosecuted with a cruelty beyond that prescribed by the Papacy, or being simply reflective of the harsh times in which they occurred ring hollow. The Inquisition was symptomatic of a pervasive mindset in which deviation from a dominant ideology was simply not allowed, and could be punishable by anything ranging from confiscation of property to imprisonment to death. It was the evolving political situation in Europe, and the rise of the Protestant reformation, quite bloody in its own right (John Calvin’s condemnation and execution of Michael Servetus was hardly more humane than the persecutions of the Catholic Church) that slowly reined in the Church’s coercive authority, not any great humanistic awakening on its own part. If one reads Vacandard’s apologetics with a critical eye, this is not (considering its age) a bad short summary of the history of the Inquisition. For the gruesome, gothic details, Lea’s work remains entertaining. For another perspective, we have Netanyahu’s The Origins of the Inquisition in Fifteenth Century Spain, which treats in exhaustive detail the persecution of converted Jews in Catholic Spain, an area ignored in this study. This work is available through Internet Archive (http://www.archive.org/details/inquisitionacri01vacagoog), and in a reprint edition as linked below.